"What is panning? And what is panning in photography?" Hint: It doesn't involve a frying pan. 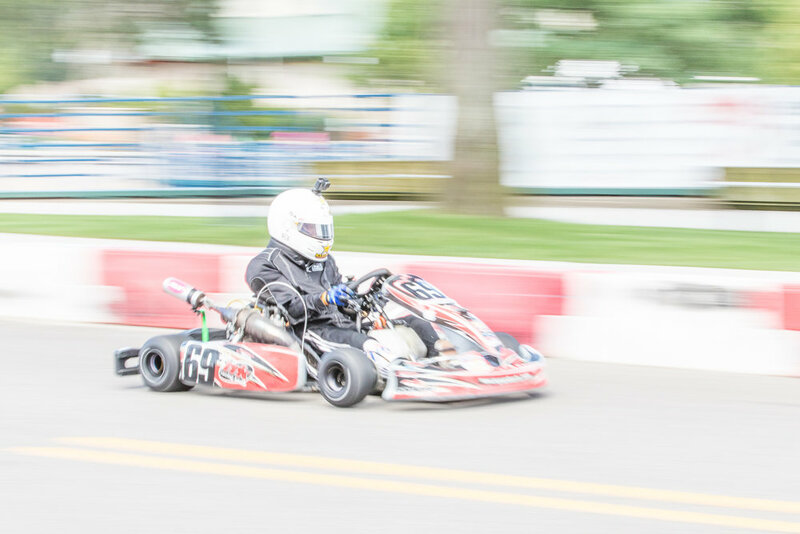 In this post, I will explain to you what the panning technique is and I will show you photos I took Saturday at a kart racing event here in Elkhart Indiana. More photos from the event can be found on my Instagram page. The two photos above illustrate both the panning technique and a 'regular still' photograph. It's up to the photographer to decide on what they want to portray in an image and manipulating shuter speed is one way to do that. Panning during a photo is a technique use to convey motion, where the photographer moves his or her camera to follow the subject in frame as it is moving through its environment. The subject can appear still and sharp while everything else in the camera's frame is blurred from the movement of the camera. Common subjects of this technique include aerial and terrestrial animals and vehicles, people on rides, or anything that moves. So how do you properly capture a subject via panning? Set the shutter speed slow enough to allow you to pan and capture the blur of the environment while you are panning your lens, but quick enough that you are not picking up other unwanted movement. Some examples of unwanted movement could be the bounce of a car over a bump (other way to describe a change in direction of travel however brief), the movement of something on the subject itself, and the shake of your camera as you are panning. The longer the shutter remains open, the chances of capturing unwanted movement in your panning shot increase. Below are some examples of unwanted movement from panning shots taken yesterday. Setting the shutter speed is only part of taking a good panning photo. The most perfectly timed panning technique can be ruined with inadvertent over-exposure if you are not paying attention to the other two elements on the exposure triangle: aperture and ISO. When shooting totally manual, the photographer needs to decrease the aperature or decrease the ISO setting or both when slowing down the shutter speed to attain a good panning shot. For example, proper exposure requires ISO 400, f/5.6 and 1/250 second and you want to decrease the shutter speed to 1/60th second for panning. That is a two-stop difference that is made up by decreasing the ISO two stops to 100 or decreasing the aperture two stops to f/11 or decreasing the ISO and aperture one stop each to ISO 100 and f/8 respectively for total of two stop effect on exposure. If dealing with aperture and ISO is too much to think about, you can have your camera do the thinking for you by setting the ISO setting to Auto and photo setting to timer/shutter priority. With the camera set to timer priority, the camera does the calculation to set the aperture to correct setting for proper exposure. A potential problem exists with the limits of your camera for aperture and ISO while at the desired shutter setting. In such cases, the use of a neutral density filter may be necessary to get you the desired reduction in exposure. You do not need a camera that can shoot 10 frames per second. My 6D that has a speed of 3.5 fps did just fine as I captured 2-3 shots per burst. I did well with single (non-burst) shots as well. However, what you do need is a camera that tracks your moving subject and focuses on that subject while you are shooting. On canon SLR systems, it's changing the Autofocus mode to Servo mode so it tracks continuously under the selected aoutofocus point while you have your finger on the focus button. I hope these tips on panning helped you out. I had a blast shooting yesterday. People were giving me room while I repeatedly swung around my 70-200mm lens with lens hood as the karts zoomed by me. I bet that was a sight to see! So go and have fun with it. Not many of the photos you first take will come out sharp. Mine were not. Heck, a good amount of my panning photos yesterday were unusable. But with practice, you will get there and you will be proud of showing off this technique.